While reading about the history and building of Stonehenge, I was reminded of a book by Alfred Watkins, “The Old Straight Track”. I had read this book with fascination many years ago. I must give credit to Mr. Watkins for my interest in Stonehenge. Particularly his mention of the Queen Stone, which originally started life off as a Gwyn Stone. Alfred Watkins discovered that this stone was named the Quin Stone on old estate maps. Cornish, Quin = Welsh, Gwyn. He seemed rather puzzled about it being called that, since it is reddish in colour. Gwyn means white in Welsh, but also, holy. That fact puzzled me for a time until I learned that the same element could be found in gwy as in dwy. Although in modern usage, dwy, means two, an obsolete meaning for dwy is God. Names like Gwydion and Gwion came immediately to mind. There are several other obsolete words beginning with dwy, such as, Godliness, Godly, divine, divinity, holy, Goddess, etc. That explained why Gwyn meant holy, but what had a red stone to do with white? Mr. Watkins was also good enough to tell us what was cut on each of the four sides of this Gwyn Stone, which is situated on the horse shoe bend of the River Wye. The word, Wye, is also connected to dwy and gwy. Geologists will say that the grooves on this rock are from weathering, archaeologists will say that they were made by archers sharpening their arrows. Alfred Watkins felt that they were cut by the hand of man, these grooves end at ground level. If archers did sharpen their arrows there, they only kept the message in good shape, the weather would have helped as well. This rock is square, with its corners turned to the cardinal points, and its faces to the cross quarters. That alone would tell you which direction you were travelling in. These squares with their corners turned to the cardinal points are still used on maps today. The stone has grooves on all four sides. Each side has an Ogham message on it. But it was the message on the SE side that was most interesting. It was the clue to unravelling some of the puzzling things at Stonehenge. While I was reading “The Old Straight Track”, I was also becoming acquainted with the Ogham tract. I use Coll Hazel’s Ogham. The last five letters of the tract are called the Forfeda, and I have seen various examples of this, and the meanings of several of the letters are often switched around. However, Colin Murray’s seem to be correct, because of several intriguing things I have found. This is not your ordinary ABC alphabet. Instead, each letter has many symbolic meanings attached to it. It was a semi secret language used only by the elite and the Druids among the Celts. It has been suggested that the Druids brought it with them when they came from the Continent to Britain and Ireland. However, Julius Caesar did say that the Druids started in England and then went to Gaul. According to Bryan Sykes, the earliest ‘Celtic’ or proto Celtic people were the Windmill Hill people. The majority of the Celtic DNA found in the UK and Ireland, has its roots on the Iberian Peninsula, and has a history in the male line going back to Cro-Magnon. This is under debate at the moment, with others theorizing that it only goes back to the Neolithic. However, among them was a small strand from the eastern Mediterranean, and also a small strand from north Africa. Their DNA is different from the later Celts found around Lake Neuchâtel and the Hallstatt area, from which we get La Tène artefacts. La Tène is not far from Italy’s northern border, fairly close to the territory where the Ligurians lived. In fact, it is only one degree north to Lake Neuchâtel from Picollo San Bernardo. Even though there may have been thousands of years between the movement of the Windmill Hill people into the UK and Ireland, and the Celts who are said to have descended from the Milesians, their DNA is similar. Among male descendents of these people, the clan of Oisin is most prevalent. Out of eighty five men tested in Wales, ninety two percent came from the clan of Oisin. That was the highest percent anywhere, including the Iberian Peninsula. There are others who believe that the Ogham tract was started by the Gnostic missionaries in Ireland, but since I have found an example of Ogham dating 79 AD at least, and the Gwyn Stone is believed to date back to the Bronze Age, I have to wonder about this story. No one really knows how old it is or where it actually started. There has been an Ogham found in Egypt in Ramses VI tomb. The date for his rule was 1160-1148 BCE. One of the things said about the Druids is that they gained their knowledge from the ancient Dodmen who were in the UK and Ireland. These were the ancient astronomer/surveyors who created some of the earliest trackways known as leys. However, it is interesting to note that the first trees to start growing in England after the last Ice Age were:- birch, pine, lime, elm, ash, oak, alder, beech, maple, hornbeam (oak family), elder (honeysuckle family); shrubs, holly and hazel, plus ivy and mistletoe. Around 3500 BCE there was a decline in elm trees, and it is believed that Dutch Elm Disease may have been the cause. In the Ogham tract we find:- birch, fir/elm, ash, oak, alder, elder, beech, holly, hazel, ivy, mistletoe and honeysuckle. The mistletoe shares a spot with heather and the letter is named Ur in the Irish Gaelic. I found this interesting since there was a city in Sumer named Ur. It has been argued that this arboreal version of the tract could not have started in the UK because there was no Silver Fir there, but Ailim/Ailm means elm in Gaelic, not Silver Fir. Alfred Watkins found rows of fir and pine close to ancient sighting points. Such as the Constable Firs, ancient Ogham messages planted on the landscape. Although he never mentions Ogham, his theory was that these trees would have been replanted if one died. I think the replanting of these trees became a tradition, even long after people didn’t know about the messaging, that’s why they are still there today. People are very attached to their traditions. There was always a fir tree there, and there will always be a fir tree there, even if they no longer understood why there was a fir tree there in the first place, but this must have been very important at one time, since it was carried on. Single trees were planted also, and very long lived specimens, such as oak or yew, were used for this. It is possible that elm was replaced by fir and pine after the decline in elm trees. Silver Fir, Scotch Pine and elm trees have one thing in common, they’re all very tall, and since this letter symbolizes high views and long sight, that does seem to be logical. Since Alfred Watkins found rows of fir or pine near ancient sighting points, the trees were sending the message, high views and long sight ahead. The trunk of the birch is white and is said to “lead the way”. Easily seen from a distance, even on a Moonlit night. On the SW side of the Gwyn Stone is the symbol for Birch, and it points toward Lands End. It has already been found that St. Michael’s Mount in Cornwall figures in the St. Michael’s Ley, and is on the St. Michael-Apollo Line which runs from Mount Carmel to Skellig Michel in Ireland. These leys are now referred to as ‘lines of incidence’. From St. Michael’s Mount, one could make a new directional beginning. Northwest to Skellig Michel, southeast to Mont St. Michel in France, where you can follow the line through France, several places connected to St. Michael in Italy, then on to Dodona, Corfu, and eventually make your way to Mount Carmel. From St. Michael’s Mount, Cornwall, you can follow the St. Michael’s Ley northeast into England, where you will find some interesting megalithic constructions, such as the Hurlers, Glastonbury Tor, Avebury, Silbury Hill, Big Rings and Waulud’s Bank. It runs a great distance along the Ickneild Way, and meets up with the Ridgeway Path, a track that goes back to the Neolithic. Some of the ‘Roman’ roads may have been constructed over much older roads and trackways. In some places, archaeologists have found much older ‘paved’ roads below the Roman ones. The ancient surveyors may have been responsible for the straightness of these roads, not the Romans. You could follow the St. Michael’s Ley all the way to Yarmouth, and after a short period of sailing, be over on Heligoland and northern Germany, and various other areas in Scandinavia. This line may be much older than anyone realizes, since Doggerland once existed between the east coast of England and the west coast of Denmark, Germany, Holland, Belgium and part of France. It’s quite possible that this line started on Doggerland, and entered England at Yarmouth. Yat is an old Saxon word for road, track or ley, as in Symond’s Yat, which is not far from the Gwyn Stone. Gate, is another form of yat, and there’s Gateshead close to the border of Scotland, the head of the yat. Yarmouth is on the River Yarre, so obviously these names are connected, but perhaps, yar, was another form of yat. It would be easier to say Yarmouth, than Yatmouth. Yatshead and Yatmouth don’t seen to fit the mouth at all, whereas Yarmouth and Gateshead seem to roll off the tongue much better. Archaeologists have found evidence that Mammoth were once hunted off the coast of Yarmouth, and during the last Ice Age, only the south of England was free of ice. Hunters and gatherers trekked trough this area for millenia. On the SE side of the Gwyn Stone is the symbol for Ash. It points in the direction of Stonehenge. The Ash of the Ogham tract is the Cosmic Ash, that which links together the microcosm and the macrocosm. The microcosm being the Earth, and the macrocosm being everything else out in space. Considering that it was also a very accurate calendar, the name becomes even more appropriate. Below are the twenty five symbols of the Ogham tract. The line on which all the letters sit, is called the strip of the whale’s back, but symbolizes the horizon. And that’s of, not off. I believe that the strip of the whales back also symbolizes the measuring cord. The rolled up strip was kept in the Crane Bag along with Manannan’s treasures. The first twenty letters always remind me of shadows cast by a pole standing in sunlight. The last five seemed as if they should belong to surveying. X marks the spot, and a square with its corners turned to the cardinal points. We still use the last of these on maps. The third symbol is two parallel lines, crossed diagonally by two more parallel lines, creating a diamond shape in the centre. Surveying is done by triangulation. The Hook, which when seen on the side of a staff, looks more like an ancient surveying or star watching instrument. The hook usually represented is so turned in on itself, that I can’t imagine hooking anything with it. As a surveying instrument it would be quite handy. Not only could you use it to sight with, but you could also carry a line along with you. That would be very useful if you were ‘stretching a cord’ at Stonehenge. If you had a few of them, your line wouldn’t be dragging on the ground. After all, someone had to make it by hand. The last symbol in this group looks like a net made up of squares. This net is not always the same in various Ogham tracts. I have three by three, this is what Colin Murray used, but I have seen two by two and four by four also. A three by three grid was also an emblem among the ancient Mesopotamians. It was named Bab-Ilu, the Gate of God. A four by four grid would be one quarter of a Square of Hermes, which is eight by eight. These five symbols, are said to be Manannan’s treasures, and he kept them in the Crane Bag along with the rolled up strip of the whale’s back and the rest of the letters of the tract. The Crane Bag was made out of the skin of a white Crane. When the tide was high, the bag seemed full, but when the tide was low it appeared to be flat.This is an allusion to the Moon, so his treasures were visible at the time of the full Moon, but not at the dark of the Moon. Crane knowledge is shorthand for Druidic knowledge. St. Columba was said to be a Crane cleric because he was brought up in the Druidic traditions and understood Ogham. After doing some more reading, I became aware that the colour white was also attached to many ancient monuments in the UK and Ireland. The banks at Stonehenge, Avebury and several other sites are white. Newgrange and Knowth were surrounded by white quartz. At Thornborough, the top layer of the banks was white gypsum that had been brought from elsewhere. The West Kennet Long Barrow was white, as well as Silbury Hill. The Long Man of Wilmington, the Cerne Abbas Giant, the various large depictions of horses are all white. Bran’s head is said to be buried at Bryn Gwyn, the White Mount, where the Tower of London stands now. Perhaps that should be the Holy Mount? After all, Bran’s head was buried there. And the hill at Glastonbury Tor, was it also white at one time? This adornment with white can be found over on the Continent as well, mostly white quartz or limestone was used. Where there is white quartz, there could be gold. I wondered about the white Crane, and found that among its allies are the Ibis and the Egret. All long-legged wading birds, which all have white varieties. The flight profile of the Ibis is much the same as that of the Crane. Some Ibis have a curved bill, but Storks, which are Wood Ibis, have a straight bill similar to the Crane. Was Manannan’s Crane somehow connected to the Ibis headed Thoth? He was the Egyptian god of writing, mathematics, astronomy, surveying, equilibrium and healing. Were the original surveyors in the British Isles, Thothmen? In Welsh, Thoth would be spelled Ddodd. Did it then become Dod later? The ancient surveyors in the UK and Ireland are still called the Dodmen. The Ibis and the Crane were connected I found, they are just another version of the Constellation Cygnus. Many different birds seem to be connected to this group of stars. Ibis, Crane, Swan, Vulture, Goose, Gannet, and other water fowl, but mostly white with a little black in most cases. There’s an interesting story among the Irish legends concerning Fintan, the Ancient White One. Because he is the oldest shanachies/seanchais in the group, he is asked to relate the history of the people of Ireland. He says that he was born before the Flood, and that he was married to Cessair, Bith’s daughter. Bith was supposed to have been another son of Noah, who is not mentioned in the Bible, but who figures in Irish legends. When Cessair brought her people to Ireland, the Flood overtook them, and they all died except Fintan. He survived by turning himself into a salmon. The salmon in Celtic lore ate the Hazels of Wisdom, and so by saying he turned into a salmon, Fintan is actually saying that he used his knowledge to survive. He recounts the various things that befell successive peoples who came to Ireland, but every time he himself survives. Eventually someone mentions how lucky he was to survive all that, since several thousand years have gone by. Fintan, the Ancient White One, replies, “Someone always survives”. This story seems to be telling us that the line of seanchais in Ireland go back to Sumeria. It is in Sumer where we find the oldest Flood stories. I don’t mean to imply that Druidism went that far back, only that there does seem to have been a core of knowledge which was passed on from one generation to the next, usually to the priestly class, which usually passed from fathers to sons and daughters also. Ancient kings and their family members were often the priests and priestesses, astronomers and oracles. I call this the White Trail, and since Sumer is where we find the oldest advanced civilization, it probably started there. Anu’s White Temple is at Uruk, one of the oldest temples in Sumer. There is a connection between Sumer and the UK and Ireland. Among the Windmill Hill people there were descendents of a woman whom Bryan Sykes names ‘Jasmine’. She was found at Mureybet in present day Syria, fifty miles southeast of Aleppo in what archaeologists say is the oldest farming community that’s been found to date. It isn’t very far from Gobekli Tepe either, which is now thought to be the oldest ritual/settlement complex dating c9000 BCE. At Mureybet, the grain these people grew was still the same as the wild grains their seeds came from. A thousand years later at Jericho, people were growing genetically altered grain. Grown over centuries of selective harvesting and planting of grain. At that time, Mureybet would have been in the area of what became Sumer. Jasmine lived there c8000 BCE. Her descendents have been found on both sides of the Mediterranean, up into continental Europe, came with the Windmill Hill people, and were also found at Skara Brae. The goddess Freyja of the Scandinavians is said to have her roots with the Sumerian goddess Inanna, whose main temple was also in Uruk, very close to Anu’s White Temple. The question is, did Jasmine’s descendents trek across land for three thousand years, or is it possible that some of the Windmill Hill people had a closer connection to the Middle East when they landed in the UK and Ireland? This does now seem to be the case. Bryan Sykes has shown that descendents of Jasmine may have travelled by water, and that they brought farming with them. Their movement seems to have occurred at about the same time as the Cardium Pottery people, who are also considered to have been the first farmers in Europe. Their oldest pottery found to date was in Corfu, c6500 BCE, after which they moved along the northern coast of the Mediterranean, and were into the Iberian Peninsula and France by c5500 BCE. Most of their movement along the northern coast of the Mediterranean occurred within a period of 500 years. It is believed that they moved in groups by water, and created new settlements along the coast. They were also the earliest farmers in these areas, and seem to have introduced farming to other people. It has been suggested by archaeologists and other experts, that these people were sent out in groups to settle new places. Who exactly sent them is a mystery. Their pottery has also been found in Iraq, Palestine and Jordan. The culture which started in Mureybet, spread out, also moving into Iraq, Palestine and Jordan. Their remains have also been found on Mount Carmel. However Jasmine’s descendents came to be among those seafarers who arrived in England, they came from an old farming tradition. By the time the Cardium Pottery people arrived in France, there was already herding of domestic cattle there, introduced by an earlier group of genetically related people to Jasmine. J (Jasmine) and T (Tara) are the only two haplogroups connected to the spread of herding and crop growing, they migrated into Europe sometime between c8000-6000 BCE. These two groups have a common background in JT and pre-JT. The place of origin of J and T was in the Caucasus and the Fertile Crescent c43,000 BCE. At Tumulus Mont St. Michel in France, c6850 BCE, someone’s cremated remains were placed in a stone cist, along with 28 Fibrolite and 11 Jadeite axe heads, a Turquoise necklace and one of Jasper. The cist sat E/W on the Equinox line. It was also surrounded by fifteen smaller cists containing ox bones. It was then covered over, creating a tumulus. Eventually it was greatly enlarged, and up until the nineteenth century, people still built a bonfire and danced up there on June 21st. Over time Tumulus Mont St. Michel went from being Equinoctial, to being important on the Summer Solstice. The earliest known mining of Turquoise was on the Sinai Peninsula by the Egyptians. Iran, Cornwall, Saxony and Silesia are also mentioned as having Turquoise, but how far back it was mined in these areas, I haven’t been able to discover, nor where the Turquoise came from in the necklace. This tumulus is close to Mont St. Michel which is on the St. Michael-Apollo line. The line runs through Liguria on the northern coast of Italy. The stone for the hand axes buried in France, came from the Ligurian Alps, and in Liguria we find the same mix of people as on the Iberian Peninsula, and parts of France. These people had something in common with the Windmill Hill people, and the people of many other places where early farmers show up. They built megalithic constructions. On the Picollo San Bernardo we find a stone circle, and in the nearby Aosta Valley a megalithic complex has been discovered. Although some of the earliest megalithic constructions in Europe have been found in Portugal and Ireland, it seems to have spread very rapidly. Even Gotland has Neolithic structures dating c3600 BCE. Most of these can be categorized as complexes. They often include Dolmen, passage tombs and stone rows or circles. Most have been found to have astronomical alignments. Some having to do with the Moon, but others are also aligned to major events of the Sun, and also have possible connections to planets, stars and constellations. The oldest stone ‘circle’ found to date is at Nabta Playa, Egypt, dating c6000-c4000 BCE. The circle is egg-shaped rather than round, but is believed to have been used for astronomy and calendar keeping. There are now claims that suggest Adam’s Calendar, made of dolerite, may date to c25,000 BCE. If this is correct, then Adam’s Calendar would be the oldest. However, a circle of small rocks or a plain henge could have been used for the same thing. The markers would have been portable stones to mark the important events, whether connected to the Moon, Sun, planets or stars. Some very early henges have been found in Cornwall, one of the earliest areas for mining metals in England. These were mined here before the Bronze Age started in England. A henge is basically a large round area with a ditch and bank surrounding it. There’s generally one or two openings which allow access to the henge. 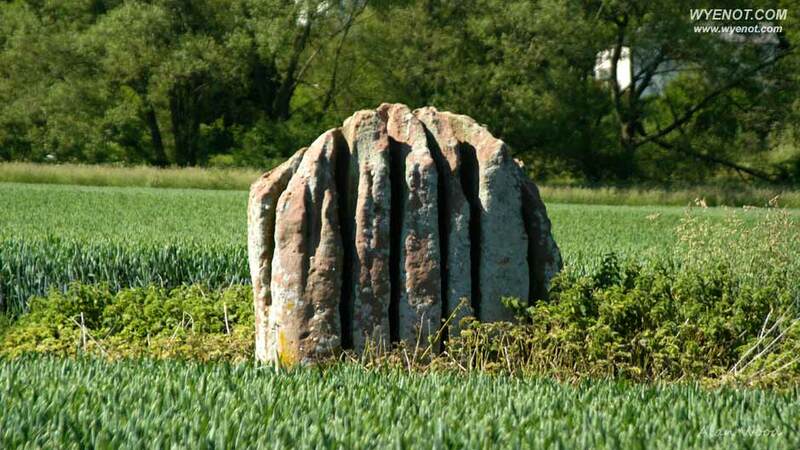 It isn’t known what they were used for, but later stone circles where generally within a henge. Since most stone circles have astronomical significance, it’s not a far leap to suppose that a plain henge was used for this as well. It’s a fact that a calendar can be created anywhere on Earth, using nothing more than a plain circle plus some markers for significant events, such as the Equinox, the shortest and longest day, or to track the movements of the Moon, planets and stars. They were often constructed in places where there was at least one major feature on the skyline, such as a hill of two where the Moon or Sun rose or set on a certain day. At Maeshowe passage tomb in the Orkneys, the Sun sets between two hills on the shortest day, and shines right into the passage. Maeshowe can be seen from the Ring of Brodgar and the Stones of Stennes. These three are now considered a complex along with the Neolithic village of Skara Brae. Some of Jasmine’s descendents were found at Skara Brae. I posed my original question about Jasmine’s descendents because there are some disquieting things among the ruins of the constructions left by the Neolithic people in the UK and Ireland. Their expertise of construction, astronomy and their knowledge of the calendar can be seen at Stonehenge and many other sites in these areas. Skara Brae is also……………..odd. We are told by archaeologists that this was a village, but has more the feeling of a one story apartment building. We are told that the people who lived here were probably an interrelated family group. But there is something not right about this picture. I can understand that they would want to bar the outside door to the complex, but why was it necessary for them to be able to lock up each individual dwelling? Each dwelling had a low opening for a doorway, and a stone slab which could be fitted in the opening. Good for keeping out the draft, but there were also signs that there had been wooden bars to lock these doors closed. This sort of behaviour does not fit in with an interrelated family group in such an isolated place. Privacy in each dwelling could have been achieved just by hanging a piece of hide over the opening. This seems more the behaviour of strangers or strangers who were tenants? There were people at Skara Brae long before these houses were built. They were built within a midden, and people had been there long enough to create quite a sizable heap. The inhabitants excavated the midden, and built their stonewalled houses inside of this. The remains of the midden then became the outside insulation, and stopped drafts or water from seeping in through the thick stone walls. The Skara Brae houses also had latrines with drainage to carry off the waste. The whole place feels as if it had been transplanted from some other more densely populated centre with a higher standard of civilization. Skara Brae, after all, was a very long way from any high civilization at that time. How then did the people of Skara Brae come up with these ideas? And who exactly were they? And what exactly were they doing there? At present some archaeologists think the people who lived here may have been of the priestly class (astronomer/surveyors?) who were the brains behind the Ring of Brodgar, the Stones of Stennes and Maeshowe. At the moment they are busy digging what seems to be the remains of seven buildings, possibly a temple complex. Time will tell. There may be many other things lurking beneath the soil, or out under the lakes and off shore. The problem with digging into ancient history is that one usually ends up with a multitude of questions. Stonehenge is one such example. It also becomes apparent that religion and astronomy do seem to go hand in hand the further back in history one goes. The oldest accounts of temple building usually mention “stretching of the cord”, and putting in the corner-stone of the building. It also mentions the fact that the buildings were aligned by Sun or Moon or stars, and that a special day was waited for before the dedication ceremony took place. Even when the temple was complete, the special day was waited for. Sometimes for months. This can be found in the account of Gudea, a Sumerian king who lived c2200 BCE. The reason for this, is that the temple was the place where the calendar started, and you would need a special day to do this. In the earliest temples, their first day was usually the Spring Equinox. This changed over time, from people to people. Usually by the order of some god. A god, or people from a higher civilization? Only where was that higher civilization? At Stonehenge we see building in reverse order. First they built the calendar, then the temple. The first part of Stonehenge was a calendar and included the outer bank, the ditch, inner bank, the four Station Stones, their mounds and ditches, the Aubrey holes, a marker at the Heel stone, markers at F and H, the two posts on the right bank of the Avenue, which are not numbered or lettered, the posts marked A1, 2, 3, 4, and possibly other outliers. There are many positions on the Aubrey hole circle which at first glance relate to the Sun, but many of these spots are related to the Moon also. For instance, today, Station Stone 93 to H, marks Winter Solstice Sunrise, but it is also very close to the midway point of the 18.6 years travel of the Summer Moonrise. However, in 3200 BCE these positions would have been a few degrees to the NE of where they are now, but with this setup, they could count the days, years, keep track of the phases of the Sun and Moon, planets, constellations and eclipses. The first thing that was done there, was a long period of observation. In fact, observations may have been taking place there since c7000 BCE, this is when the first posts to mark the Equinox were placed here. Another set of posts were placed on the Equinox line c6000 BCE. The locations of these two sets of posts are in the current parking lot, filled with concrete. Whoever placed Stonehenge on this spot may have been looking for this place on purpose. It is located at the only place in the Northern Hemisphere where the Sun and Moon have their maximum risings and settings at 90°. So that the Station Stone quadrangle could be created. The only other place on Earth where this can happen is close to the Falklands Islands in the Strait of Magellan. I wonder will some underwater archaeologist find another Stonehenge there some day? While this long period of observation was going on, there was probably much cord stretching and rock placing. All you need to survey a place are some surveying instruments, some cord and some rocks or stakes to mark the important places. Two straight staves will do as surveying instruments. At first you can use small rocks to mark the appropriate points, no need for the heavy ones until you’ve found what you are looking for. They were not only looking for the Equinox line, but also the maximum risings and settings of the Sun and Moon. When the henge was constructed, they were already tracking eclipses, and this became part of the construction. They kept track of planets and significant stars as well. They were in the Neolithic, rocks are the most basic of markers. My theory is that these people already knew all the significant positions long before they created the henge and the Aubrey hole circle. Boulders, large rocks or more posts may have been placed there early on. The henge and Aubrey hole circle were just a new technical improvement over just posts and large rocks. The Aubrey holes allowed them to create a permanent calendar, so that they could keep track of days, seasons, years, cycles of the planets and stars, and the eclipses. In diagram A, we see the first part of their surveying. First they put in the Equinox line, which runs from Aubrey hole 93 to F, although these two points may not have been created until later. Although I’m mentioning the Aubrey holes in connection to the lines, no Aubrey holes existed at that point, only the lines. Next they put in the line from Aubrey hole 28-56-A4. A4 is one of the four small posts on the Avenue. This was the Summer Solstice Sunrise line in 3000 BCE. Then they put in the line from Aubrey hole 14 to Aubrey hole 42, quartering the area and giving them a centre to work from. The Station Stone quadrangle is basically a rectangle 12 units by 5 units, but dividing this again would give 24 units by ten units. Measuring out twelve units from the centre on both sides of the centre line, they strung two lines parallel to line 28-56. These are the black lines A and B. The blue lines are the Major and Minor Winter Moonrise positions in 3000 BCE. The centre blue line which runs past post A3, is the mid-point of the Winter Moon’s travels. It takes 18.6 years to travel from the Minor to the Major points. Gerald Hawkins found that this movement of the Moon worked in a cycle of 19, 19, 18 years between the Minor and Major point. The Moon appears over the central line every 10, 9, 9 years, so twice as often than the other two points. The green line over the Heel stone is 5° northwest of the Winter Moonrise Minor point 3000 BCE. Once the Moon traveled close to this on its way northwest, it entered the zone which was important to the eclipses of Sun and Moon. Eclipses which happened both at the full Moon closest to the Winter Solstice and at the full Moon closest to the Summer Solstice. This zone is approximately 7° wide, and between the green line running to post A2 and the green line over the Heel stone is the area where these dangerous Moons would appear. The green line from the Heel stone was drawn all across the circle as shown. This line was used to help set up the Station Stones. The next step was to put in the Station Stones. At Aubrey hole 14, they measured 5 units NE and 5 units SW. This gave them the positions of Station Stones 91 and 92. From Station Stone 91, they drew a line parallel to line 14-42 all the way over to where Station Stone 94 would be placed eventually. This line sits at 90° to the Summer Solstice Sunrise line c3000 BCE. The line from Station Stones 92-93, sits at 90° to the green line coming from the Heel stone, which was at 5° northwest of Winter Moonrise Minor point c3000 BCE, and was the danger zone indicator of eclipses once the Moon had travelled northwest of here. The fact that they did this, shows that they were definitely taking into account the eclipses from the beginning when they built this place. We haven’t even come to the Aubrey holes yet. Diagram B shows the next step in the surveying. From the centre to Station Stone 93 was used as the radius of the circle. Diagram B is a copy of Diagram C which was originally drawn by hand, and after trying several points on the circle, I found that the centre to Station Stone 93 worked best, so I gather these points were used for the diameter. After creating the circle, they marked in the quarters and cross quarters of the circle at 7, 14, 21, 28, 35, 42, 49 and 56.These are the blue dots. The positions of the Station Stones were marked, these are the green dots. The black dot is F.
Since I’m neither a mathematician nor an astronomer, I have no idea about the theory that was used for the next part, but it worked very well. Some genius must have been at work here. One of the first markers on the Aubrey hole circle would have been F. Station Stone 93 to F is the Equinox line. Once they had marked the circle for the Aubrey holes, they could then determine how far away they wanted to place the bank. Men could start digging the ditch to create the inner and outer banks. While this was going on, the surveyors started marking in the rest of the Aubrey holes. They strung a line between Station Stone 93 and F. (green line) Then they measured the distance between Aubrey hole 56 and F, and transferred it to the northwest side, creating point A. Then they strung a line between A and Station Stone 92. They transferred the measurement from A to F, to the SW side of the circle, using Aubrey hole 28 as the centre, creating points B and C.
Then they strung lines from B to Station Stone 91, and from C to Station Stone 94. The resultant green diamond or lozenge has angles of 80° at Aubrey hole 56, 100° at Aubrey hole 42, 79° at Aubrey hole 28 and 101° at Aubrey hole 14. The difference in angles is due to the distance between the Station Stones being shorter on the northwest side than on the southeast side. At this point they strung lines parallel to these lozenge lines at the cross quarters 7, 21, 35 and 49. (blue) The result being that they now had two parallel lines the correct measurement between three Aubrey holes. This configuration can be seen on the gold lozenge found buried with the Wessex lord in the Bush Barrow, which also has angles of 80° and 100°. The Stonehenge Logo as I like to call it. It’s at the very heart of the layout of the Aubrey holes. It has been discovered lately by J. Giesen that this beautiful artefact may have been used as a vernier for keeping track of all the Major Sunrise and Moonrise events. The Wessex lords belt hook is a quadrangle, just like the Station Stone quadrangle. Then they divided the distance between these Aubrey holes and drew their central lines. This gave them three Aubrey holes at each cross quarter. It was only at those positions that they were able to arrive at the correct measurement between Aubrey holes. Once they had the correct measurement, they could put in the three Aubrey holes at each of the four quarters of the circle, using 14, 28, 42 and 56 as the centres. All the red holes are the ones left over after all this stringing. This left four pie shaped pieces with three Aubrey holes each, and four pie shaped pieces with five holes each. For the ones with three holes, they likely divided the angle in two and then in two again. For the sections with five holes, they divided the angle for the central hole, and then used their previously found measurement for the next two Aubrey holes on either side of this central one. And, voila, we have 56 Aubrey holes, and the Wessex lord’s gold lozenge may be proof that this was the method used to lay out these holes. It is my belief that the last five letters of the Ogham tract, called the Forfeda, had their birth at Stonehenge. By joining Aubrey holes 28/56 and 14/42 they had created X since these positions sit almost NE/SW and SE/NW. By joining Aubrey holes 49-7, 7-21, 21-35, and 35-49 you create a square whose corners sit almost N, S, E and W. Now you have a square with its corners turned to the cardinal points. That Square of Enlightenment. The basic configuration for this layout was started with two parallel lines crossing two parallel lines. The green lines and then the blue lines. The Hook was the surveying instrument used, and the line was the measuring cord. They did create the Net, and even though it was not three by three squares, it is still Bab-Ilu, the Gate of God. In this case, it may have been the Sun god’s gate or possibly the Gate of Min, who was a very early Egyptian Moon god, whose festival day was the Summer Solstice. After coming to understand what happens in the area of the Avenue, I can see that this had as much to do with the Moon as the Sun, and highly important for predicting eclipses. Min is one aspect of Khnum, Khem and Thoth. One of Min’s devices was a disk inside of a crescent which is lying on its’ back. I have seen this device over Thoth’s head in several pictures, and I have read that this device is carved at Gobekli Tepe. After delving into ancient Egyptian history, I discovered that there had been a movement of people who migrated from Egypt into Sumeria c10,000-c9000 BCE. It’s thought that these people brought farming to ancient Mureybet and the rest of the Fertile Crescent, and that they were responsible for building Gobekli Tepe. Considering that Min’s device made it to Gobekli Tepe, this could to be correct. The people who built Gobekli Tepe seem to have been very advanced for their time. The stone carvings there are highly unusual for that time period. Lets look at what these symbols represent. X is named the Grove, a sacred place. All the knowledge, which represents all the other symbols of the Ogham tract, can be found within the Grove. Each tree and plant symbol holds its own knowledge, and so the Grove contains all this combined knowledge. If Stonehenge was the Grove, then many things may have been going on there, including healing, since almost all the trees and plants in the tract have medicinal uses. The square with its corners turned to the cardinal points is named Oir or Spindle, but it has an alternative name, Tharan or Thunder, but it is the lightning which is referred to. Just as a flash of lightning will illuminate the night sky, a sudden flash of inner enlightenment may light up a prickly problem which you have been dealing with. These sudden flashes of insight often lead to new inventions, discoveries, and ideas. But Oir is also connected to perseverance in the face of a difficult task, which is generally what you need for a prickly problem. I call it the Square of Enlightenment, and it was used at Stonehenge in an other very interesting way which I’ll write about at another time. Whoever dreamt up that idea was certainly enlightened. It is this same square with its corners turned to the cardinal points which we find in the Queen/Quin/Gwyn Stone, which is also a square of enlightenment since it shows the directional quarters and cross quarters, and tells you what lies in the four cross quarter directions. Spindle wood was used for spindles, bobbins and pegs among other things. The Gwyn Stone is a peg in some ancient surveying, a surveyors trig point. Since it stands six and a half feet above ground and seven and a half feet below ground, it was well pegged. Not likely to move anytime soon. The Hook is named Phagos or Beech, and symbolizes old knowledge, old writing, which suggests that astronomy and surveying have a long history. Considering that many cave paintings are now believed to have astronomical notations, it goes back a very far way. After all, people were acquainted with the night sky for millennia. When people were hunters and gatherers, they ranged over huge areas. Each feature of the landscape, the Sun, Moon and stars became their map, and told them which part of the year they were in. Most hunters and gatherers had a base camp where they spent the colder part of the year. The positions of the stars, the Sun and the Moon counts, would have told them when to head back to their base camp. Vegetation would have been a seasonal marker, but raspberries and blueberries aren’t always ripe at the same time every year, that depends on the weather, but the Sun, Moon and stars are a constant. “writing” may not have been the original word used for this type of thing. Planting trees as messages could be considered writing. Just a different sort of writing than we are used to. The word, book, also comes from an old name for Beech. Long ago, thin slabs of Beech were used to write on, and connected together to form a ‘book’. The Net is named the Sea, and symbolizes the sea, travel, maternal links and the Moon. Understanding lines of latitude and longitude, and their cross quarters, and also understanding astronomy would indeed give you the ability to travel in any direction, even by water. If ley lines, as described by Alfred Watkins, were established at that point in time, one could travel either by night or day. Mr. Watkins thought that some of the older trackways in the UK may have been established sometime between 4000 BCE and 2000 BCE. Ancient mariners used the Moon as well as the Sun and stars to navigate. If they were going any distance, these would become a seasonal marker for them as well. The two parallel lines crossing two parallel lines is named Uilleand or the Honeysuckle, and symbolizes the hidden secret. Since the layout and use of the 56 Aubrey holes has been debated for many years, this formation remained the hidden secret for a very long time, five thousand years worth of time. The bird connected to this symbol is the Pewit. It nests on the ground, and when disturbed will fly up and away, thus creating a distraction away from its eggs hidden in their nest on the ground. I found this symbolism very appropriate for Stonehenge, where the general population would have been watching what was happening in the sky, and not paying attention to the Aubrey holes. When they were filled with chalk, they would look like eggs within a nest, the big white bank creating the nest. The Aubrey holes were the hidden secret as far as the general population was concerned, but this is where the operators of the circle did their counting of days and years, which gave them knowledge of the coming of the Solstices, the Equinoxes and the eclipse cycle. Stay tuned for part II, and I’ll tell you how they did it. Y Geiriadur Mawr, “The Complete Welsh-English, English-Welsh Dictionary. This entry was posted in Ancient History and tagged 56 Aubrey holes, alfred watkins, Ogham, Stonehenge. Thanks Auntie Dot, you always were my biggest fan. Why does one dabble when another figures? I thought you might enjoy my ramblings! My MTdna is group is J* and my paternal is confusingly also J (M67 j2a1b) ..i really think the people responsible for the stone circles were mtdna H and paternal groups J and I … oisin (r1b) had nothing to do with the stone circles except destroy them or bury them .